Earlier this month, we headed down to Saunton Sands in North Devon to enjoy some time on the fantastic beach there. As anybody with a Labrador will know, securing adequate time on the sand and in the surf is practically essential to their (and your!) mental health and general wellbeing. 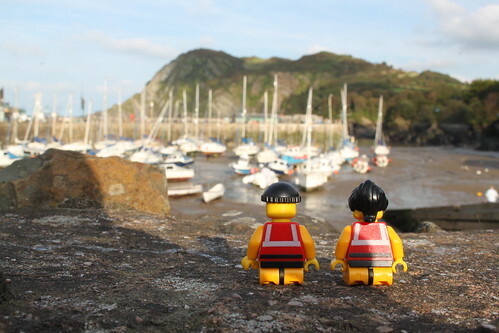 On the way home at the end of a rather long day, though, the little guys clamoured for a quick pit-stop in Ilfracombe, so that they could have a brief look at the lifeboat station there. And although we suspected that everyone would have gone home by now, we took a slight detour and headed down into the town. While it used to be a thriving fishing and trading port, Ilfracombe is now primarily a holiday destination. But the North Devon coast remains a hazardous place for commercial and pleasure craft alike. 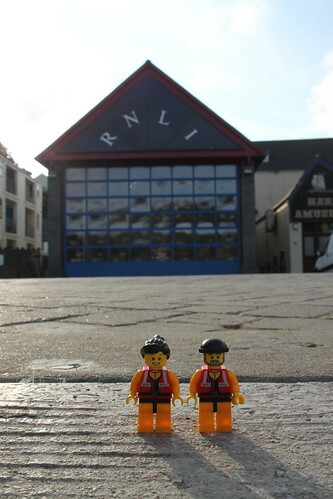 And so the lifeboat station plays a central role in the town’s history and in its present. On our arrival, the little guys headed straight up to the lighthouse in the former St. Nicholas’s chapel, perched overlooking the town on Lantern Hill. From here, they had a fantastic view both of the town and of the surrounding coastline. Down by the harbour is a more recent addition to the town. ‘Verity’, a ma-hu-sive stainless steel and bronze statue by local resident Damien Hirst, was erected looking out to sea in 2012 and has been loaned to the town for twenty years. 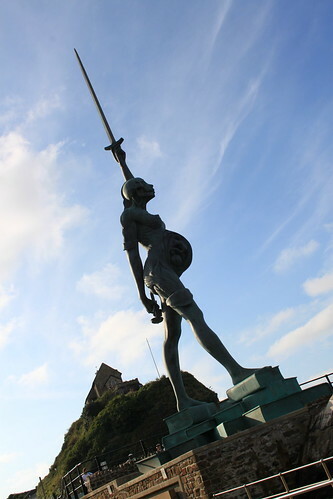 Depicting a pregnant woman holding aloft a sword while carrying the scales of justice and standing on a pile of law books, the statue is described by Hirst as a ‘modern allegory of truth and justice’. Of perhaps slightly more interest to the Crew, though, was the station’s lifeboat station. Housing the brand new Shannon class lifeboat ‘The Barry and Peggy High Foundation’ and the D class ‘Deborah Brown II’, the boathouse is situated at the head of the slipway leading down into the harbour. 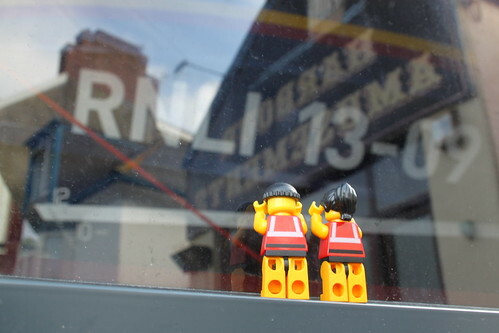 The little guys were keen to catch a glimpse of the station’s Shannon, so pressed their faces tight up against the window. They could just make out the shape of the shiny new lifeboat within, as well as that of the enormous carriage and launch vehicle, which allow the boat to be launched even when the tide is out. The Crew spent a while wandering around the harbour, while I procured some ice creams and Molly (the aforementioned Labrador) enjoyed a quick run around on the little beach. And as the sun started to set and the time for us to head for home approached, the little guys sat on the harbour wall for one last look over the harbour and the boats sheltering within it. 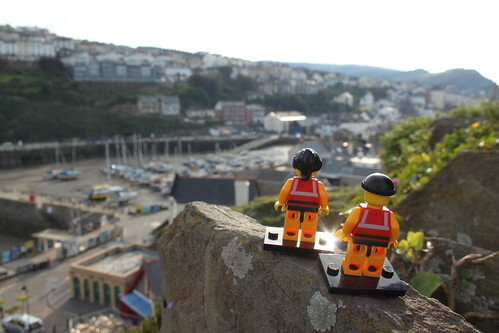 It was only a quick visit, but the little guys really enjoyed their pit-stop in Ilfracombe. 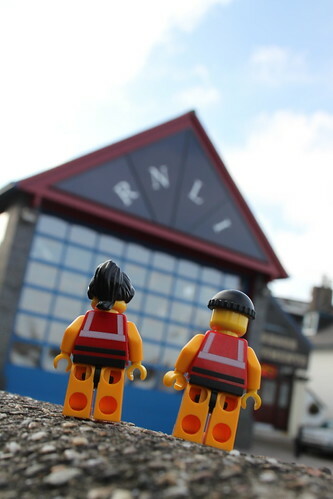 And they can’t wait to come back again, when they’ll hopefully have a chance to meet their regular-sized counterparts there and to learn a little more about the station, its lifeboats and its history on this spectacular part of the coast. This entry was posted in Out and about and tagged Ilfracombe, Lifeboats, RNLI, The Lifeboat Crew by Simon Perks. Bookmark the permalink.